Cine Thission has been ranked as one of the best movie theatres in the world by a leading media house. This open-air theatre is one of the oldest operation theatres in Athens and is operating since 1935. This theatre is located on a paved promenade that connects Thission with Philopappos Hill. This theatre features many premier shows along with blockbusters movies and re-runs of classic movies. The canteen here serves some delicious food and drinks. Visit on a summer evening and enjoy a fun evening with your family and friends. Arrive 45 minutes before the show time to get the best seats. The timings vary as per the shows. Kindly check their website for latest show timings. How popular is Thision Open Air Cinema? People normally club together Ydria Cafe - Restaurant and Glyfada Beach while planning their visit to Thision Open Air Cinema. 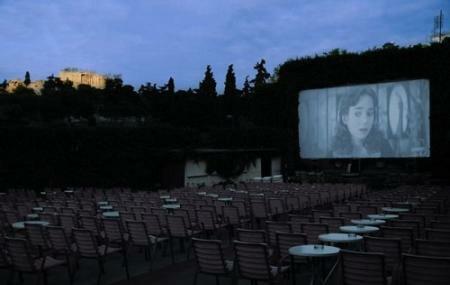 A nice open cinema in the old centre of the city with a view to Acropolis. A negative thing to say is that many times they play movies with not a big success because people visit it for its position. Lovely place to be during summer. Old but nice place with soul. There are chairs with pillows, some tables. You can also order some food like popcorn (2.5€), beer (2.5€) or soft drinks. Good movie experience. The movies all seem to be shown in English with Greek subs. There's was an intermission halfway through which seemed weird though. Lovely view of the Acropolis at night.